16 years after our shop opened, I was born. So let me move on to my experiences and about what I have thought about our Kimono shop until last year, from a Kimono shop daughter’s point of view. Looking back at my childhood, our shop was in the best of condition and managed so well. Indeed, my parents were so busy. They opened the shop from 10AM to 9PM every single day. Therefore I wasn’t able to spend much time with them. When I went to a friend’s house, I envied them for the fact that their mothers were at home (In Japan it is common after getting married or having a baby, for women to quit their jobs and become housewives). Kimonos are worn mainly by older people. It seemed so uncool to me! I hated to say what my parents were doing. For me, the Kimono shop was the reason for my loneliness and uncoolness. However there was one good point — we had no lack for money. Feeling guilty for not being able to be with me, my parents bought me almost everything I ever wanted. Yes! I was spoiled! However, the wealthy period was short. We would see two dark shadows in a few years. One was the bubble economy bursting and the other was father’s death. My father’s disease was discovered when I was a third grade elementary school student. It was liver cancer but the name had been kept secret from him. At the time liver cancer always meant death. He needed emergency surgery. However even after the operation, the surgeon said, “It’s too late. There’s nothing I could do.” We were told by doctors he was to be within a maximum of 4 years of death. It was a remarkably cold day on February 4th. 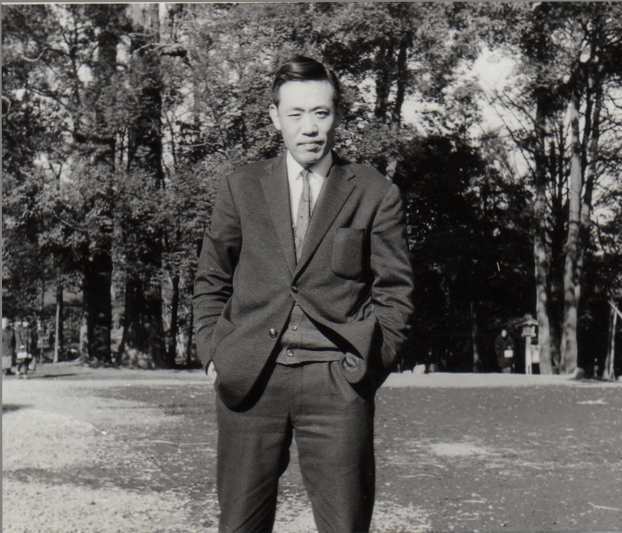 After a 3 year and 10-month battle with cancer, my father Sakae was called to heaven. He was 62 years old. He always had few words, always had his temper under control, and loved Japanese culture. He was born in south island in Japan before WW2. 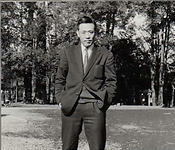 During the war, he moved to China in opposition of the war, where he graduated from high school. He then went back to Japan and in spite of receiving training to become a solder, the war luckily ended before he could use it. During the funeral service, my mother cried so much but I couldn’t cry. For 13 year old children, death doesn’t mean father’s death but simply “death.” I couldn’t stop thinking: “One day I will die as well”. The thought filled my mind. 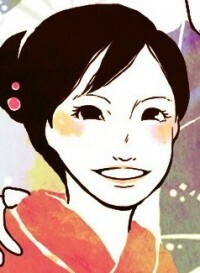 After father’s death, the other dark shadow came knocking on Sakaeya Kimono Shop’s door. Kimonos had come not to be sold at all. Just before the bubble economy burst, the Kimono industry started suffering from a recession. My mother said, “No money! What should we do?” quite often. The Kimono shop became no longer attractive to me. Therefore it was natural that I had no idea of becoming a Kimono shop owner. Until last year I hated the Kimono shop because it was the reason for my loneliness, uncoolness and poorness. Now it feels strange writing this Blog as the Kimono shop’s second generation owner. I had been looking for The Blue Bird outside, but it seems I have found it inside instead. My mother wanted to make me a preppy. Actually she had made me enter a private school from elementary to high school. She could not go to school in spite of the fact her brothers were going there since WW2. At that time parents put boys above girls to go to school. My mother has been saying often and even now she still says, “Be girlish!” to me. When I was child, rice refills had a limit of 3 times. Because eating a lot doesn’t look good and is not girlish. She thinks these lessons must be adopted by her ideal daughter. The flower arrangement- But I dislike cutting flowers a lot. It seems cruel! I stopped going to these lessons too. The Japanese traditional dance – Indeed I love it but it was too expensive. I stoppped as well. The Japanese harp – I have a basic certificate but I can’t play it at all!! I think I have tried to be my mother’s ideal daughter until last year. However, once I did oppose her request when I was a high school student. After my graduating high school, she recommended me to go to 2 yearswomen’s college. According to her, women should have lower educationthan men, otherwise it is hard to find a husband. However, I was keen on going to a 4 year university or college. Because I wanted to become an office worker at a big company and get a good salary as much as I could, so I could rise a child by myself. Why I thought like this is because my father died, but thanks to my mother, I could keep going to my private school, although it is common that woman became housewife in Japan. Becoming a good salary office worker is necessary to graduate a 4 year school. Which university you graduate from is impotent to our entering a company and our subsequent life. The higher university you graduate from, the higher salary you can get. Therefore the competition to get into good schools makes the Japanese over-concerned about our status and prestige.